Core Spirit Style Show was an amazing event to be part of! 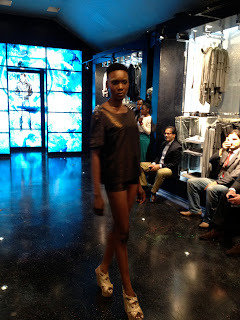 The outfit I had designed and created was chosen to be in the fashion show at the in store catwalk. As well as that, winning the competition to have my outfit manufacture and sold in the flag ship store on Bond Street! Having my own model and make up artist to make her look fabulous in my outfit was a really fun experience. To match my edgy metallic panel top with leather spiked shoulder pads and mini shorts, we gave my model Helen thick gold eyebrows and copper eye shadow, the same as the fabric used. Here is a picture of the work done by make up artist Stanimira Kireva. After the event there was an after party at the posh club China White in Oxford Circus, a free cocktail and a dance was the perfect way to celebrate the success of Core Spirit Style Show. WWB press have posted a link of the event so have a look!